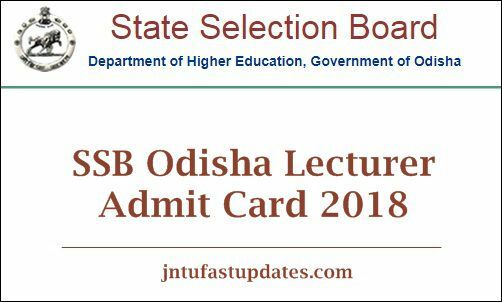 SSB Odisha Lecturer Admit Card 2018: State Selection Board, Odisha is expected to release the Lecturers in non Govt Aided Colleges Admit Card/hall ticket soon on its official portal, ssbodisha.nic.in. All the applicants who are going to clash for the SSB Odisha Lecturer examination must get ready to download the admit cards. By downloading the admit cards, one can check the details of the examination center, date, and timings information from it. All the competitors who are going to attend the test must carry the admit cards without fail. The hall ticket/admit card is one of the most important documents needed to attend the test. And also, candidates need to carry any of the valid identity proof copy along with the hall ticket. The examination officers will only allow the candidates to process with the test only after checking the admit card and identity card of the applicants. Hence everyone who is going to compete for the test must remember to carry the hall ticket. More details such as hall ticket availability date, downloading process and other details from the following article. State Selection Board, Odisha is the Odisha State Higher Education board that monitors various aspects related to the department. The organization annually issues various recruitment notifications to hire the suitable aspirants into various designations. This tear the SSB Odisha announced a job notification for 833 Lecturer Posts. The application process was continued from 12th November to 11th December. Many of the aspirants having the suitable eligibility criteria have applied for Odisha SSB Lecturer posts during the application dates. The selection of suitable candidates will be done purely on the basis of merit. In order to shortlist the suitable aspirants into the announced designations, the SSB Odisha will conduct the written test and interview rounds. Candidates have to qualify the rounds with good merit to won the opportunity in Odisha SSB. Name of the Recruitment Board State Selection Board, Department of Higher Education, Odisha. Process for Selection Written Examination and Interview. All the aspirants competing for SSB Odisha Lecturer posts hereby informed that the admit card/hall ticket of lecturer examination will be accessible to download before 10 days of the examination (approximately). Hence the competitors can keep visiting the SSB Odisha website, ssbodisha.nic.in to check the admit card link activation. When the hall ticket is released, the download link will be activated on the website’s homepage. Simply, by tapping on it, the admit card can be downloaded. Or any other valid identity proof copy. Candidates can check all the details clearly once after downloading the hall ticket. If there are any spelling corrections in name and other columns, the candidates can report to the SSB Odisha authorities for necessary corrections. The hall ticket will be corrected and reissued again by the authority. Candidates must carry the admit card without fail while going to the examination. Report 30 minutes before the examination to avoid the unnecessary tension. How to download SSB Odisha Lecturer Admit Card 2018 Online? On the homepage, you can find the ‘Download SSB Odisha Lecturer Hall Ticket 2018’ Link. Click on the link and enter the required details such as register number, hall ticket number etc. Check the examination venue, date, timings, and other details from it. Take the printout of the hall ticket and keep it safe to carry to the examination. 1.2 How to download SSB Odisha Lecturer Admit Card 2018 Online? When will the exam. date for SSB lecturer.be announced ? Please intimate date of exam before one month. That will be helpful to us.